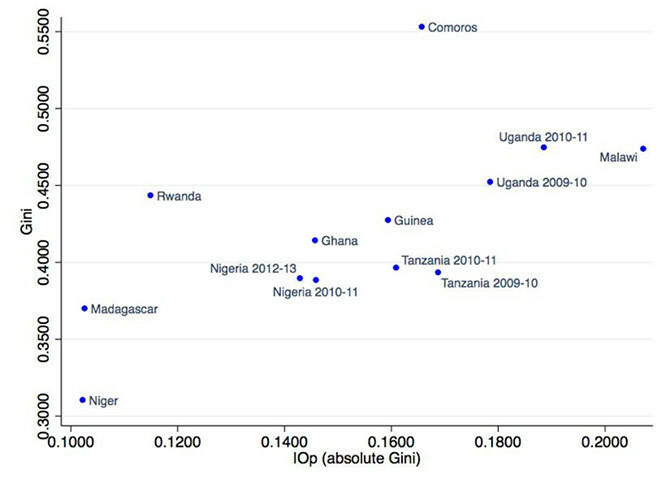 It is widely known that, compared to other continents, poverty rates are particularly high in Africa. Somewhat less appreciated is that inequality within countries also tends to be high. “ Poverty in a Rising Africa ,” the latest World Bank Africa poverty report, shows for example that seven out of the world’s 10 most unequal countries are African, with the country Gini indexes ranging from 0.31 (Niger) to 0.63 (South Africa) (with zero implying perfect equality and one, perfect inequality). However, not only the level of inequality matters, but also the reasons behind it. Unequal outcomes may result from both differences in opportunities as well as differences in effort. There is also growing evidence and consensus that it is especially the former, which is pernicious for development. Rewards by effort may incentivize people. Yet, when welfare mainly differs because of differences at birth (such as gender, ethnicity, or parental background) or, more generally, because of factors beyond the individual control, it tends to be especially detrimental for economic growth and social harmony.